When I received Mallory's wedding invitation in the mail, I knew I had to come up with a creative way to photograph the pieces since they came out so beautifully. While it took a team, a service, and a strategy to execute my vision- I couldn't be happier with the way they came out. After some deliberation, I decided to photograph these invitations at Starlight Meadow on an antique door using only soft, natural light. I thought that this combination would produce the upscale, vintage look that I had envisioned the first time I opened the envelope. The calligraphy and flowers assist in heavily accompanying this vision, as well. It takes a team to strive for vintage perfection. I reached out to some local and talented creatives I know to help me achieve the vision for this project. The flowers were provided by Lou Ann over at Southern Petals and featured white lisianthus with ivy and pink, yellow and white mother of pearl roses. These invitations were created through minted.com using the Winter Flourish design set. The calligraphy was done by the amazingly talented Alex Caldwell. Wedding photos are still in the lab but Mallory's bridal session is coming next. Until then, enjoy. Minted.com is a site to help you find the best designs and work from independent artists to make something uniquely yours. For Mallory's invitations, I decided to utilize their service because I wanted something unique, lovely, and absolutely gorgeous. Minted helped connect me with independent artists, like myself, so I loved their service- not just using it but, the impact of it. Thank you to all the other creatives on this project. Mallory's wedding photos are still in the lab but Mallory's bridal session is coming next. 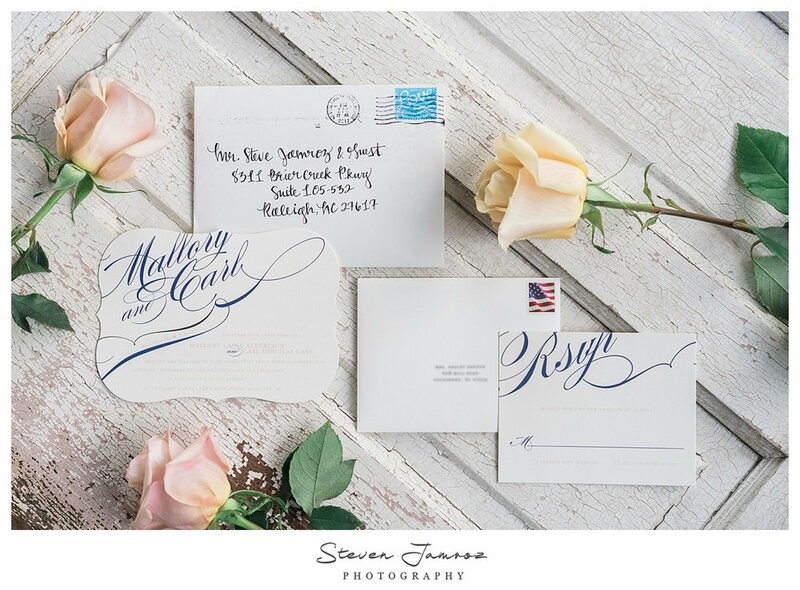 Her wedding and bridal session are just as unique and beautiful as these invitations. Until those are posted, enjoy.